Art Deco is all about glamour! It began in the early part of the 20th century as a sleek modern style. It's name derived from the Exposition Internationale des Arts Decoratifs et industriels Modernes held in Paris in 1925. The style is bold with geometric and stylised designs. The colours are vibrant with lots of contrast - deep yellows, reds, greens and blue mixed with silver, black and chrome. 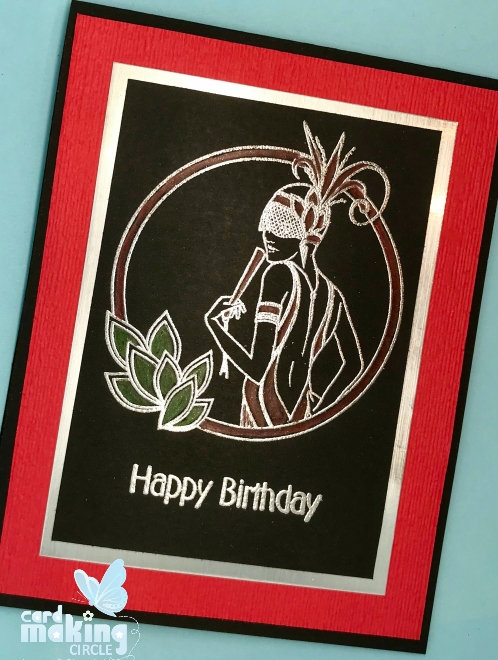 To create my Art Deco cards I used a simple and elegant stamp set from Debbi Moore Designs. Both of these cards were created in the same way. 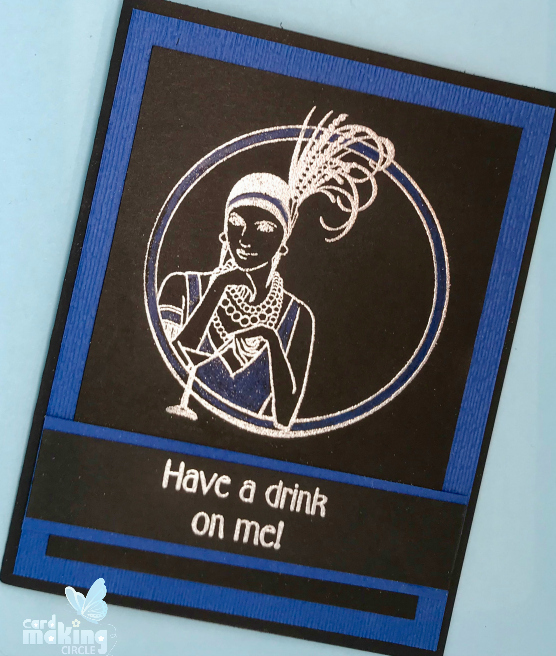 Stamp the image onto black card with Versamark ink and heat emboss with silver embossing powder. Colour with coloured pencils - I used Faber-Castell polycromos pencils. Add Wink of Stella to your coloured areas for a bit of sparkle. Dry emboss the contrasting Layer One with a subtle embossing folder (from Stampin Up!). Mount the image card onto Layer One and glue to your card base. Stamp a sentiment onto a strip of black card with Versamark ink and heat emboss with silver embossing powder. 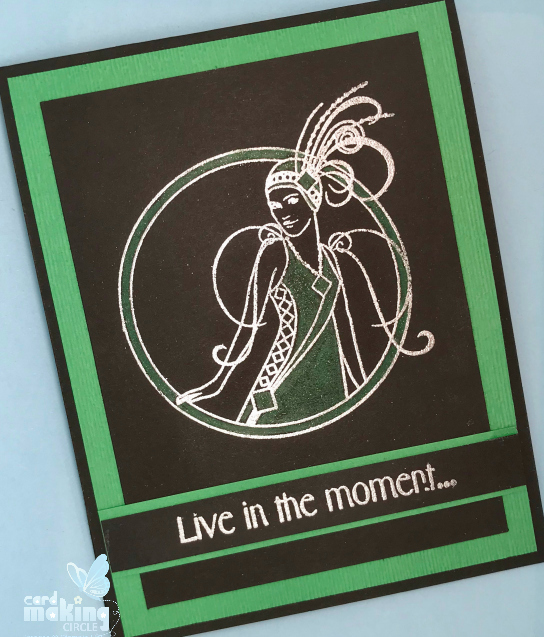 Mount this on a layer of contrasting card and glue across the bottom of the card under the image for a simple finish. Stamp image and sentiment onto black card with Versamark ink and heat emboss with silver embossing powder. Colour with coloured pencils. Add Wink of Stella to the coloured areas. Layer image card onto a layer of silver card for added contrast. 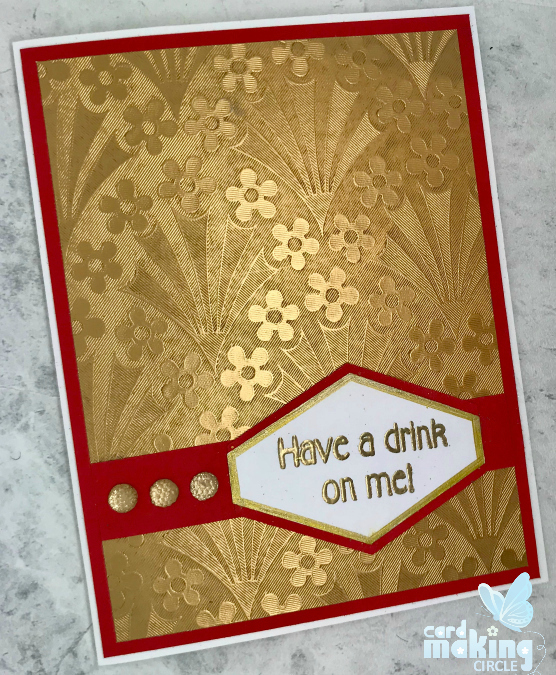 Dry emboss the contrasting Layer One with a subtle embossing folder (from Stampin Up!). Mount image card onto Layer One. Glue to card base. The final two cards use patterned paper as a background to the card design. Both use white card bases. Stamp the sentiments with Versamark and heat emboss. Punch the "Have a drink with me!" 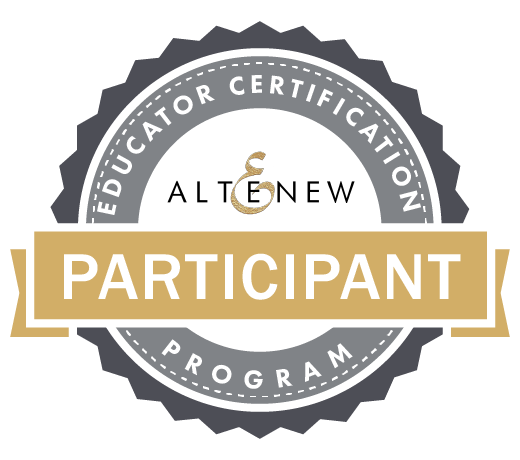 sentiment with the Tailored Tag punch from Stampin Up and outline the edge with gold marker. Use the same punch to create the sentiment layer with red card - cut in half and mount onto a red strip of card. Add gold embellishments to finish. 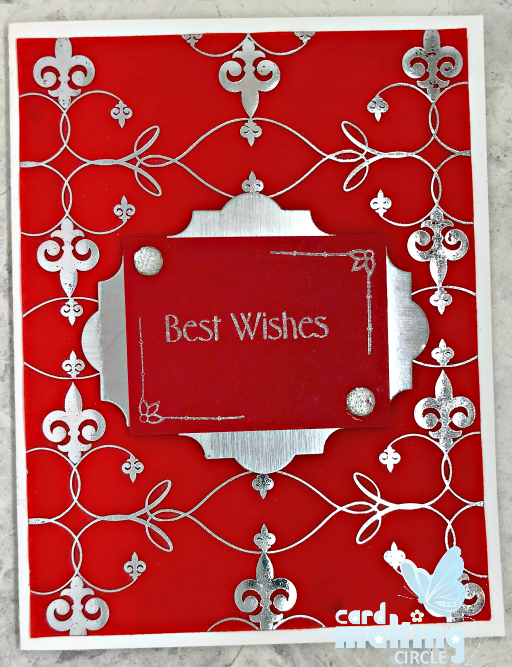 Create a silver layer for the "Best Wishes" sentiment by punching two pieces of silver card from the Everyday Label punch from Stampin Up! Mount silver layers onto the back of the rectangle sentiment and finish with silver or clear embellishments.